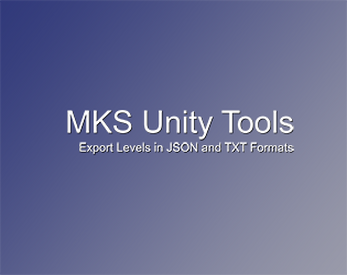 This is a collection of Unity Tool Scripts. In this release, there are C# scripts contained within to export levels (hierachical object, camera and light data) out of Unity scenes in the JSON and TEXT (comma-seperated) formats. Also, Unity Scene NavMesh data can be exported as JSON or OBJ. The exported files are saved under the current scene name with the extension *.json, *.txt and *.obj and are put into the current Unity project folder top-level path. V1.1: Changed JSON exporter to generate double instead of single quotes around elements. V1.2: Updated culture info to Invariant to ensure all floating points values are output into JSON and TEXT format with '.' instead of ',' for the decimal place. Validated scripts are also working with Linux installs of Unity. V1.3: Added scripts to export the NavMesh from the currently opened Unity scene. Export formats are JSON and OBJ.